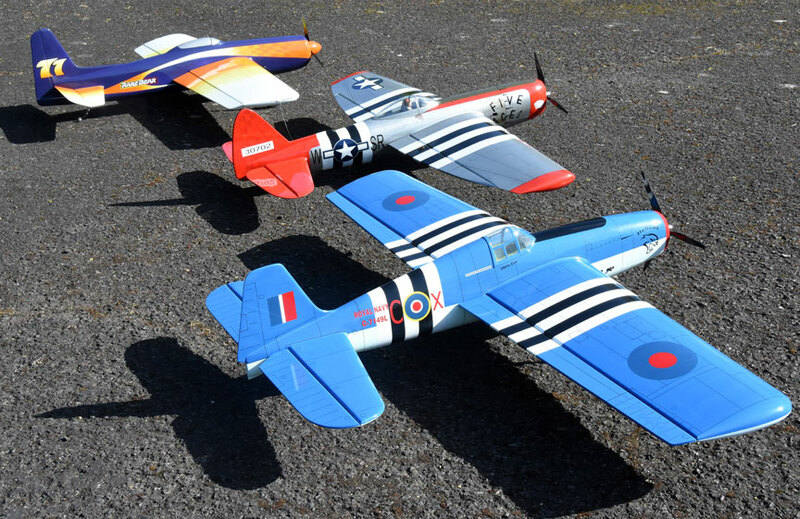 Warbirds are the trend in Northwest Expert Precision Aerobatics, as shown by this lineup at the Jim Walker Memorial Spring Tune-Up. From foreground to background: Chris Cox's Hellcat, Paul Walker's P-47 and Alan Resinger's Rare Bear. All are new for 2018; all electric powered. Flying Lines photo. 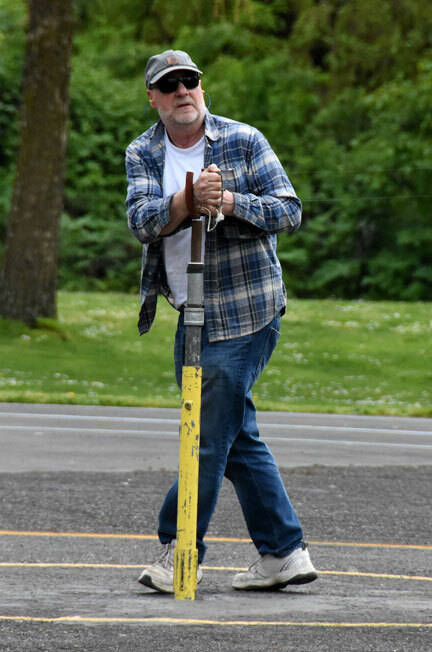 April 20-22, 2018, Jim Walker Memorial Control-Line Field, East Delta Park, Portland, Ore. 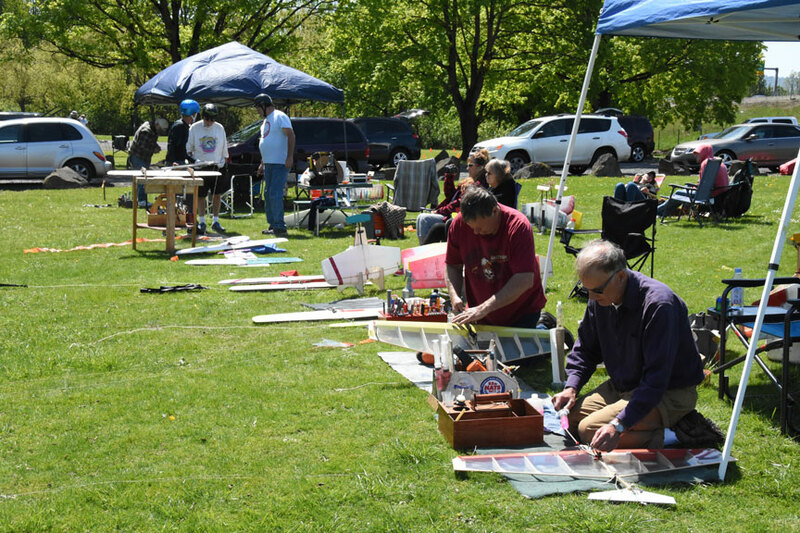 The Northwest Fireballs were pleased to welcome 37 fliers to this year’s Jim Walker Memorial Spring Tune-Up. 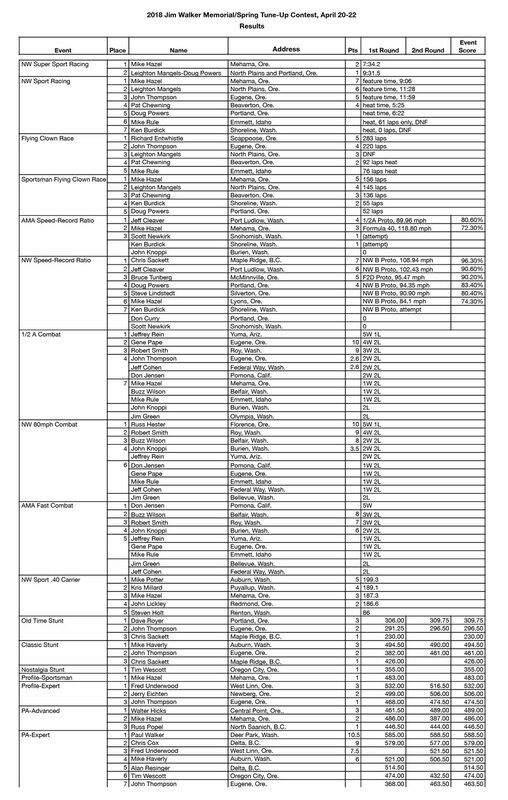 Total registration, in 17 different events, equaled 89 entries. In a departure from most years, there was not a drop of rain during the contest. Also in a departure from most years, Combat had the most entries, 30, followed by 21 in Stunt, 19 in Racing, 14 in Speed and 5 in Carrier. Contest Directors were Dave Royer and Richard Entwhistle. Event Directors were Scott Riese, Stunt; Doug Powers, Racing; Mike Hazel, Speed; Gary Harris, Combat; and Mike Potter, Carrier. Thanks to all of them and to all the volunteers who made this a successful contest. Most aren’t mentioned by name here, but every single one was much appreciated! We had a terrific time at this year’s Jim Walker Memorial Spring Tune-Up. Chef Robert's dogs and burgers were especially yummy eaten in the sunshine both Saturday and Sunday. Flying conditions were super for Delta Park. The wash station and porta-potty at the edge of the circle just makes everything even nicer. 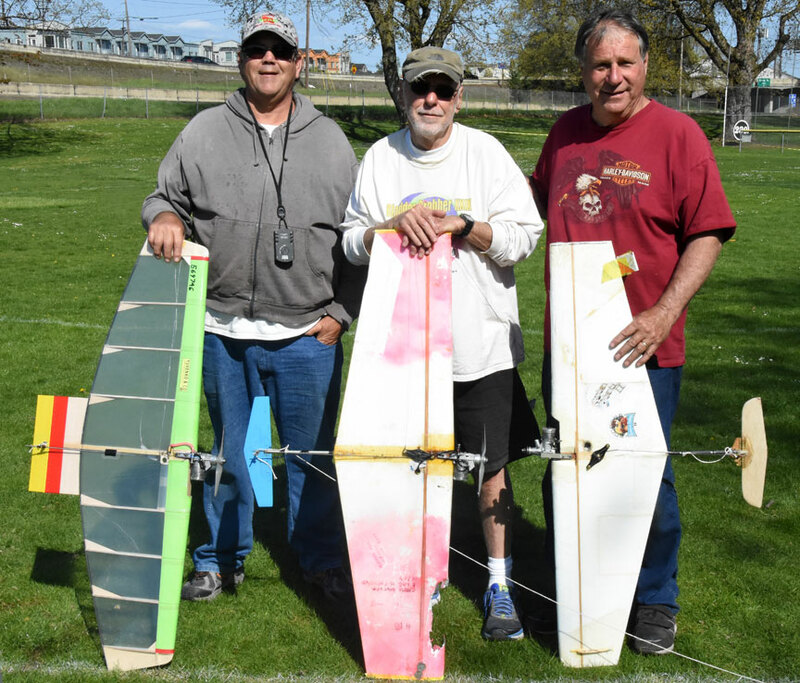 As has become something of a tradition, it seems, Alan Resinger, Chris Cox and Paul Walker all debuted new ships in PAMPA Expert on Sunday. All airplanes are quite beautiful as well as semi-scale. They look like real airplanes! The turn out was surprisingly light in Old Time and Classic for the perfect weather we had. Those of you who chose to stay home missed a really good weekend to fly stunt. And best of all, I didn't see one single crash! What I did see was lots of sunscreen being applied. It was a good one. 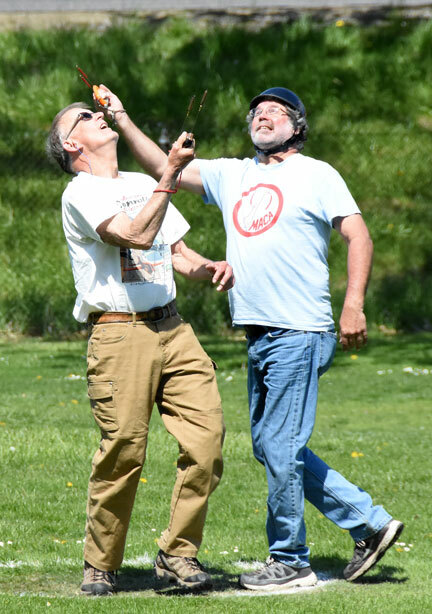 Judges for Old-Time Stunt were Tim Wescott and Scott Riese. 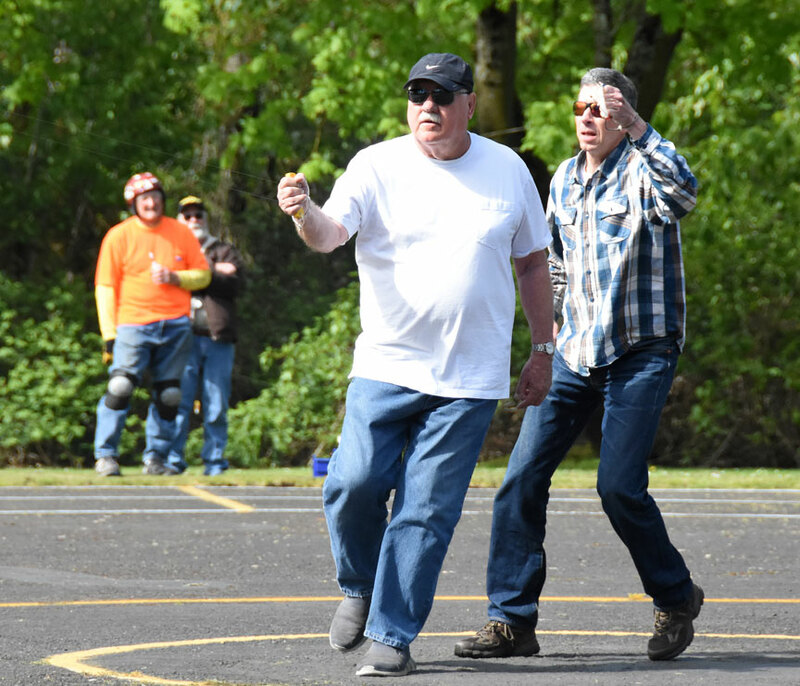 For all other events, judges were Dave Royer and Scott Riese. 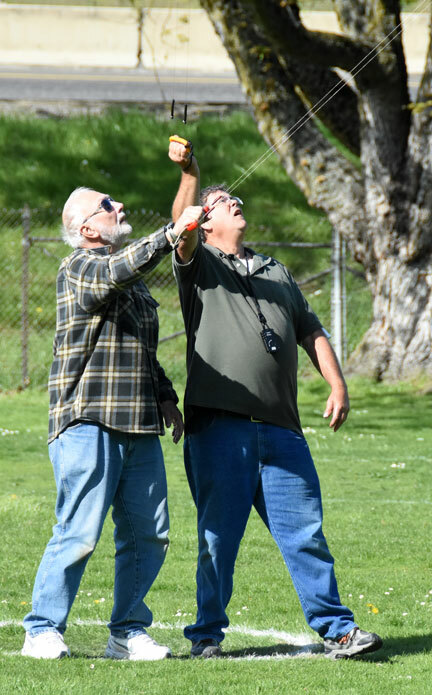 Special thanks go to the Northwest Fireballs for once again having Speed flying as part of this wonderful contest, and helping to time the flights. And special thanks to whoever ordered the weather! 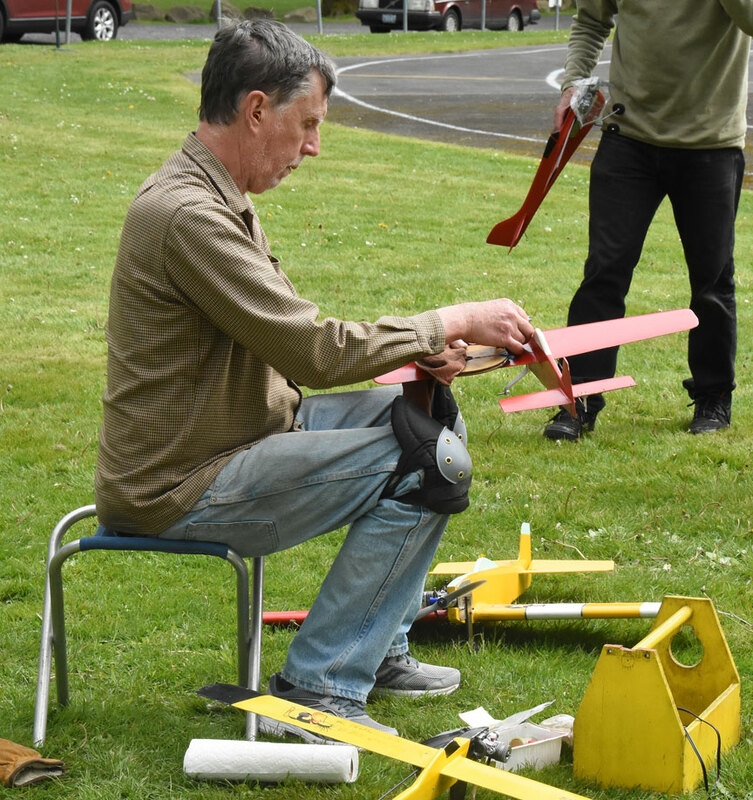 Speed turnout was good, and as usual the event that drew the most interest was our own Northwest B Proto, which saw five planes go into the air. Unfortunately, the two entries which would have been the “fast stuff” both had fuel tank problems -- Ken Burdick’s monster Nelson 65, and Scott Newkirk’s Class C.
This year a little more time was allotted for Speed, which was nice since the large racing entry on Friday pushed back the start time a bit. No records set, but a good time had. 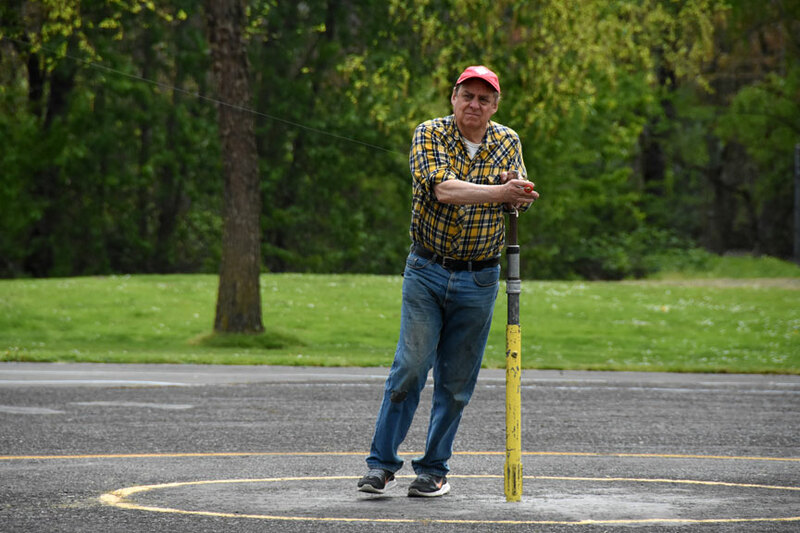 Thanks to the pilots who showed up to compete and a BIG Thank You to the Northwest Fireballs club for putting the contest on again this year. 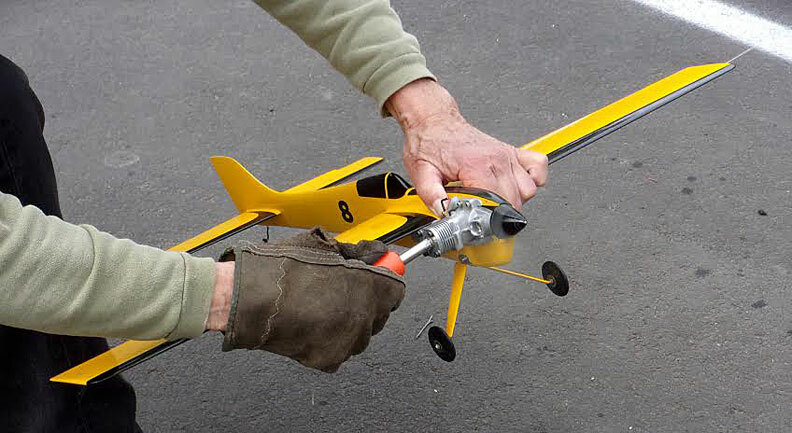 If the government knew how much fun we were having playing with these model airplanes they wouldn't let us do it. Yes, we got lucky on the weather. Just a few days ago we were getting rained on in the valley with inches of new snow falling on Mount Hood 80 miles away. Robert Ladd barbecued the most delicious hot dogs and hamburgers for everybody. Thanks much to Dave Royer and Richard Entwhistle as contest directors and Barbara White for handling so many details to make this a first class event. 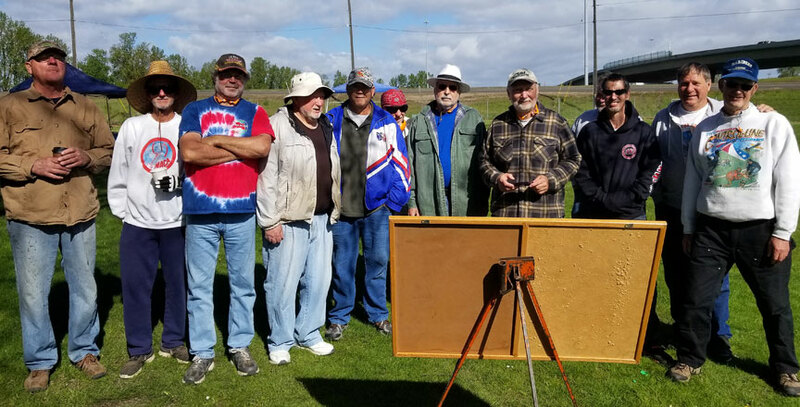 Those who helped with officiating at the combat circle: Darrin Bishop, Bill Lee, Leighton Mangels, Doug Powers and Ron Anderson. 1/2A Combat began on Saturday morning. Eleven flyers came to duke it out. Flyers came from Yuma, Ariz. (farthest), Southern California, Idaho, the Seattle area, the Oregon Coast and the southern Willamette Valley. The dueling was fun and exciting to watch. 1/2A went well with many very good matches. Next came NW 80 mph Combat, bringing out the larger planes. 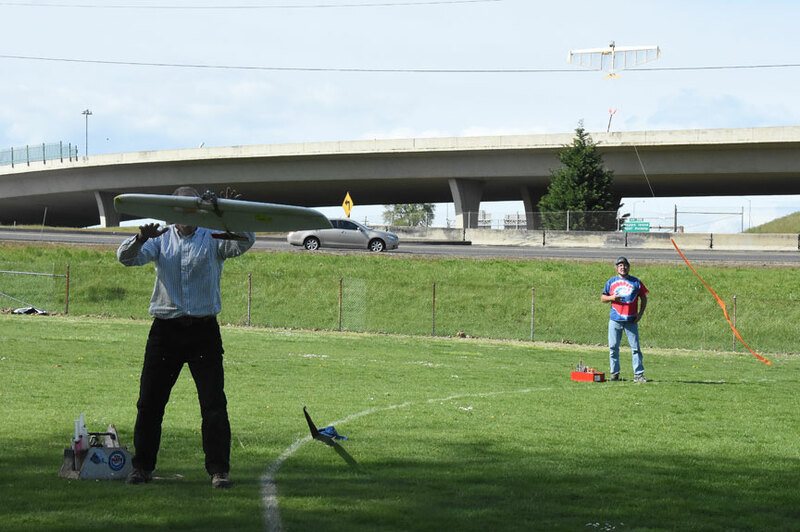 Again, we had some really good matches, providing expert competition for the talented, athletic pilots and pit crews. Two Combat events in one day for nearly a dozen flyers turns into quite a project. Two rounds of 80mph were enough for Saturday, so we stopped there. Following the end of 80 mph on Sunday, we held the premium event, AMA Fast. The adrenaline rush felt while competing at Fast Combat is extreme! Some very good matches were flown with only the occasional mid-air collision and a few planes digging for worms under the nice green grass. Fun was had by all. 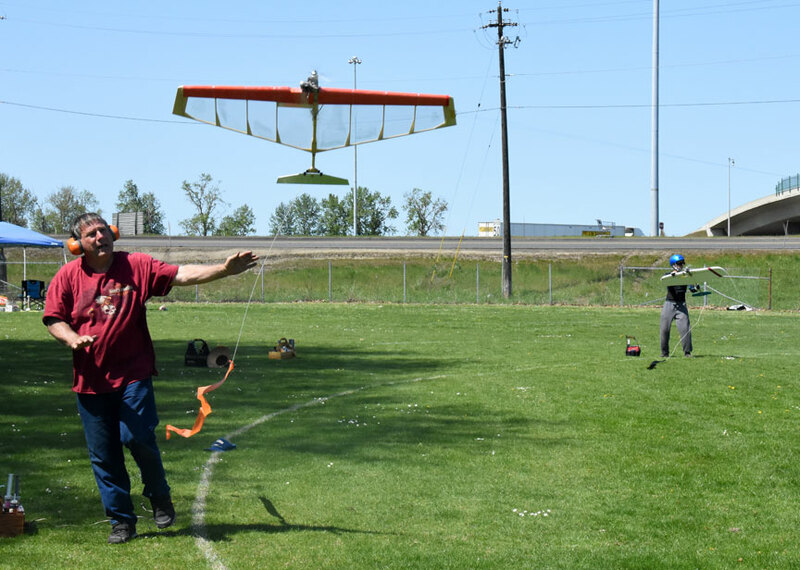 First Place in NW 40 Sport Carrier went to Mike Potter flying a built-from-plans Vought OS2U Kingfisher. 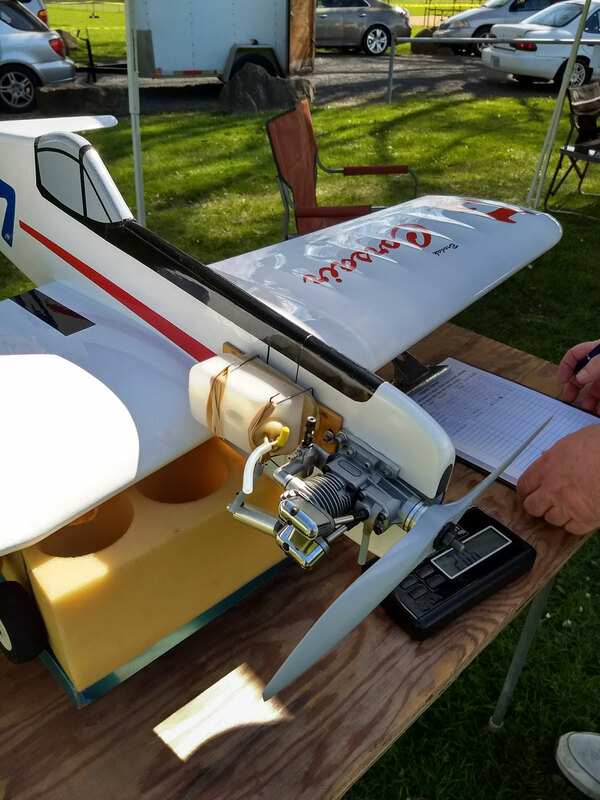 Second place went to Kris Millard flying a built-from-plans Square Cat and third place went to Mike Hazel with a Brodak P51 Mustang. Runners-up were John Lickley with a home-built Golden State MO-1 and first-time competitor Steve Holt with a Brodak F8F Grumman Bearcat . All contestants were using OS40FP engines. There was lots of flying action -- and some flying pieces -- in the Combat events. 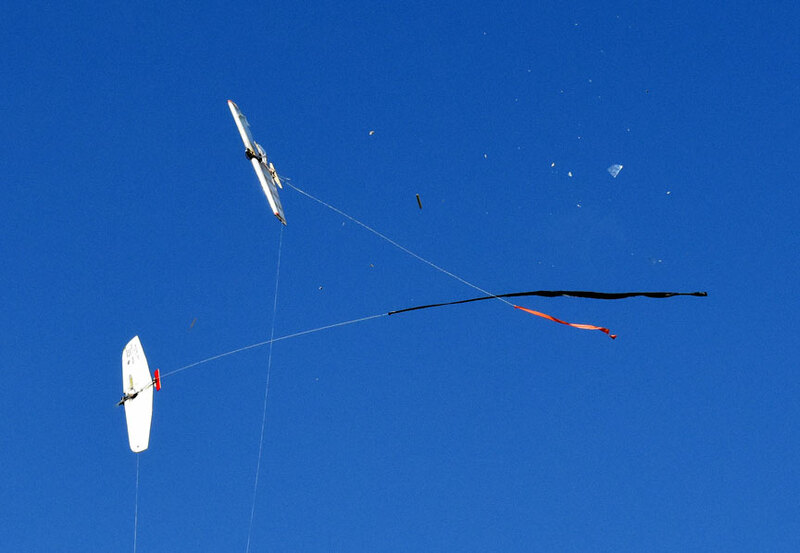 Photo catches the instant after a collision between the 80mph Combat planes of Gene Pape (left plane) and Robert Smith. Flying Lines photo. 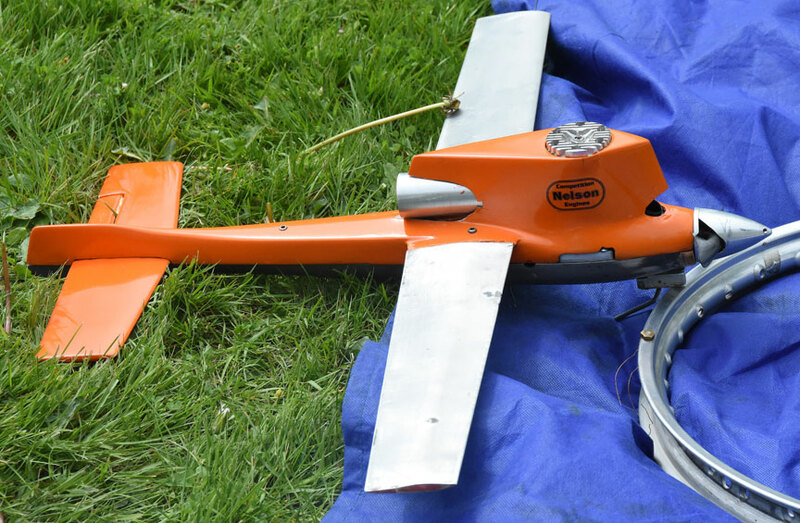 More 80mph Combat flying pieces: Plane at left is Buzz Wilson's; at right is Robert Smith's. Flying Lines photo. Racing continues its resurgence in the Northwest. 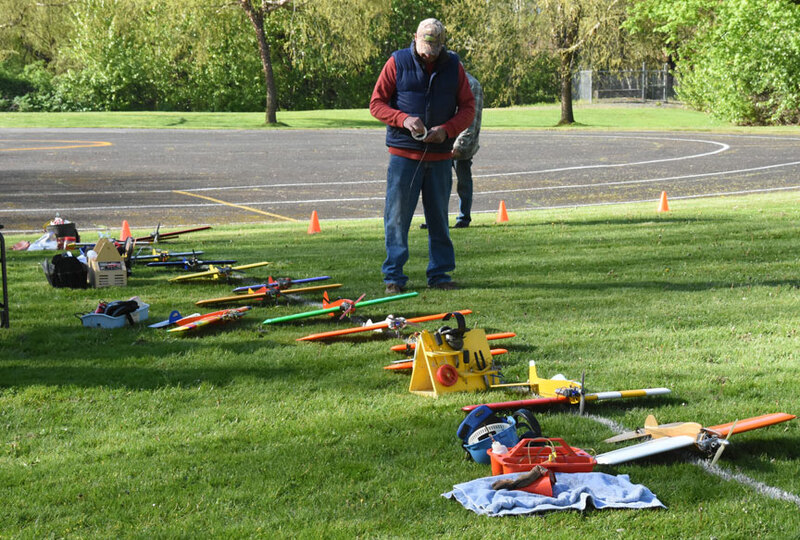 Friday's racing pits were full of Northwest Sport Race and Clown Race planes; 14 show in this picture. Flying Lines photo. Speed was held on Friday and Saturday afternoons. Here, Jeff Cleaver launches a B Proto for Chris Sackett. Flying Lines photo. Sunday was Navy Carrier Day. 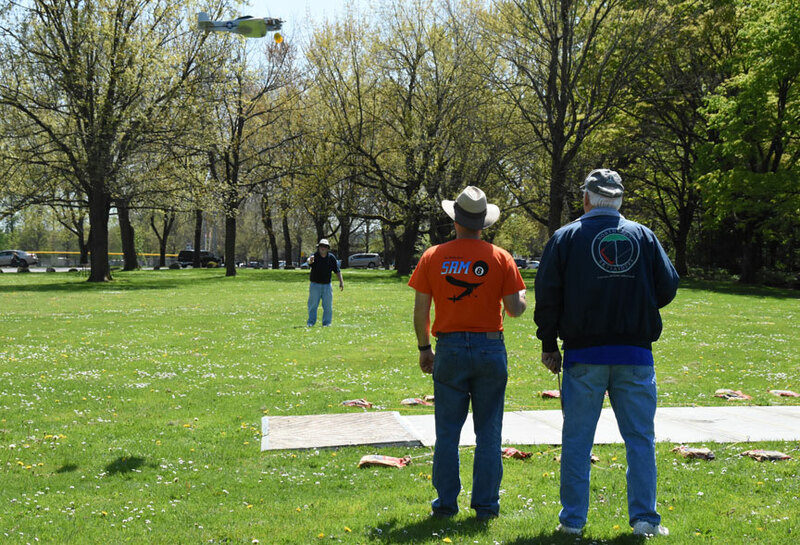 Mike Hazel's Northwest Sport 40 Carrier passes the deck, observed by judges Kris Millard (left) and Mike Potter. Flying Lines photo. 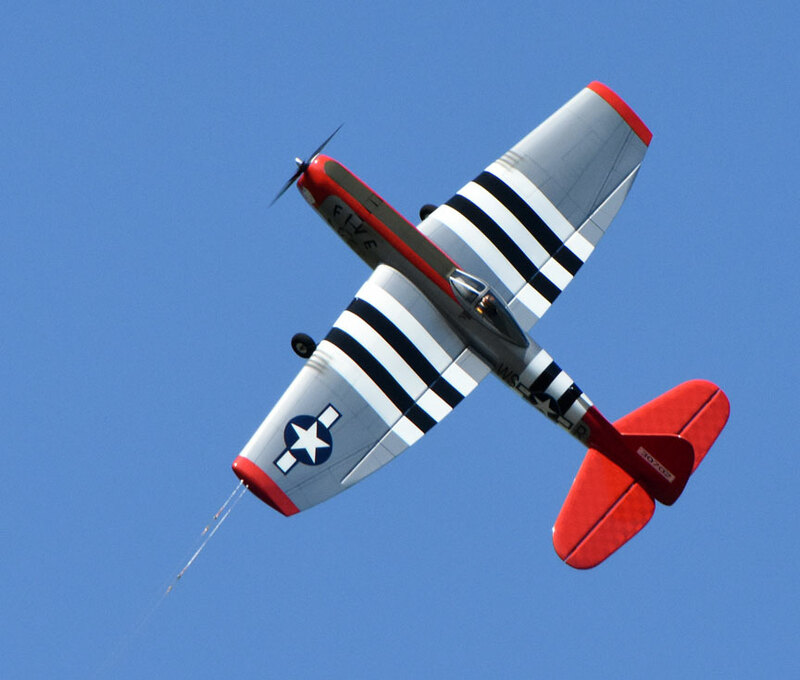 Paul Walker's P-47 makes the winning flight in Expert Precision Aerobatics. Flying Lines photo. Leighton Mangels (left) and Jim Cameron pilot Clown Racers with Leighton's pitman Doug Powers (left) and timer Bill Lee watching. Flying Lines photo. Richard Entwhistle pits the winning Clown. Flying Lines photo. Doug Powers launches Mangels' Clown. Flying Lines photo. Before the start of Combat on Saturday, all the pilots lined up for a photo. From left: Mike Rule, Jeff Rein, John Knoppi, Mike Hazel, Don Jensen, Buzz Wilson, John Thompson, Gene Pape, Russ Hester, Jeff Cohen, Robert Smith and Jim Green. Bill Lee photo. 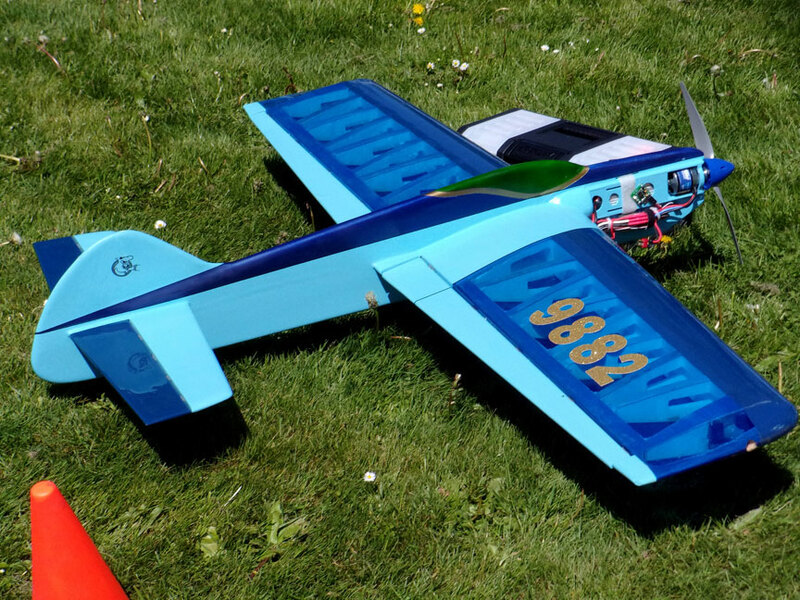 Ken Burdick's Nelson .65-powered D Speed plane. Flying Lines photo. 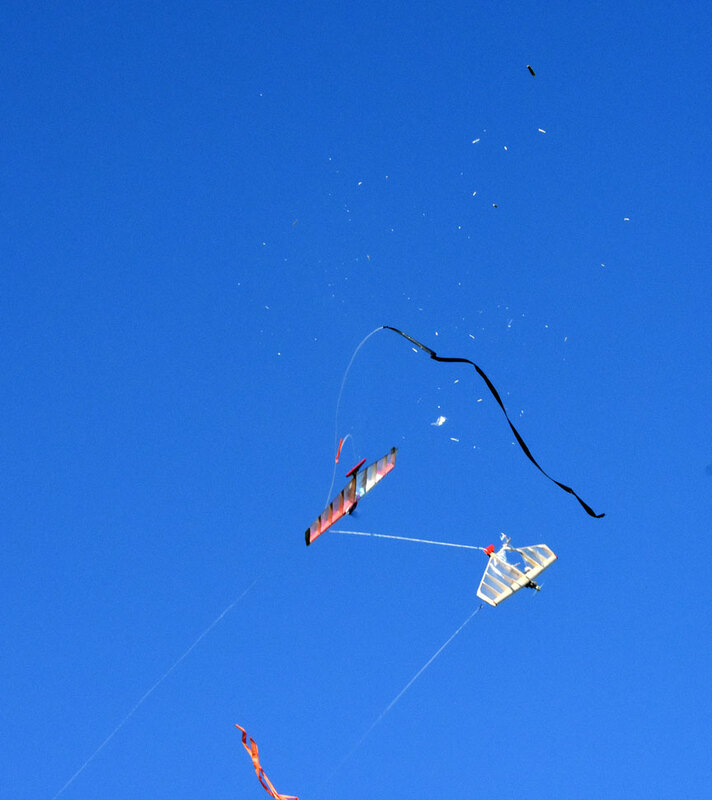 A nearly simultaneous launch in 80 mph Combat: At left, launcher is Jim Green launching for Buzz Wilson and at right is John Knoppi, just after releasing Robert Smith's plane. Flying Lines photo. 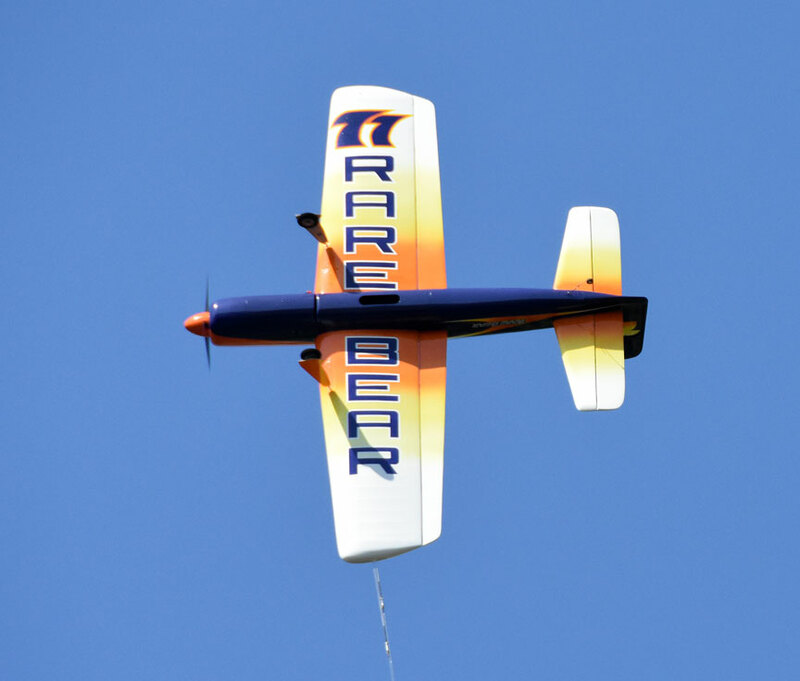 Alan Resinger's Rare Bear, as seen from the bottom, in an Expert Precision Aerobatics flight. Flying Lines photo. 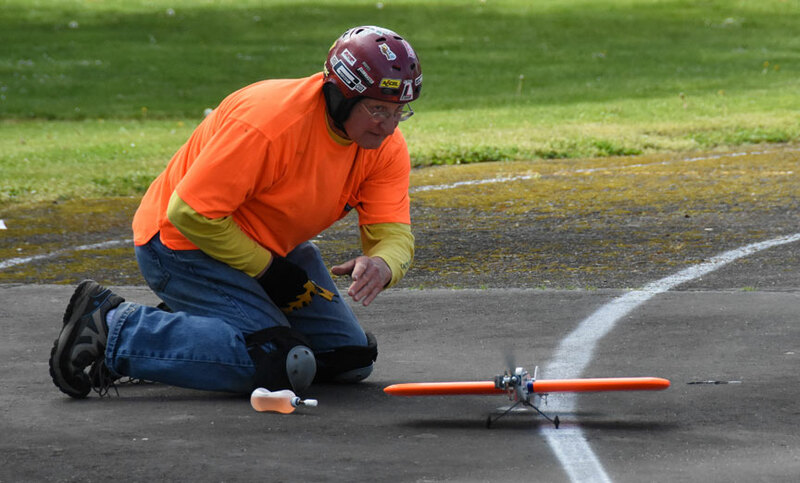 In most Northwest contests, pilots start their own engines. That means a race to the handle. Here, Buzz Wilson (near) and Gene Pape (far right) head for their handles as Robert Smith holds for Buzz and Russ Hester holds for Gene. Flying Lines photo. 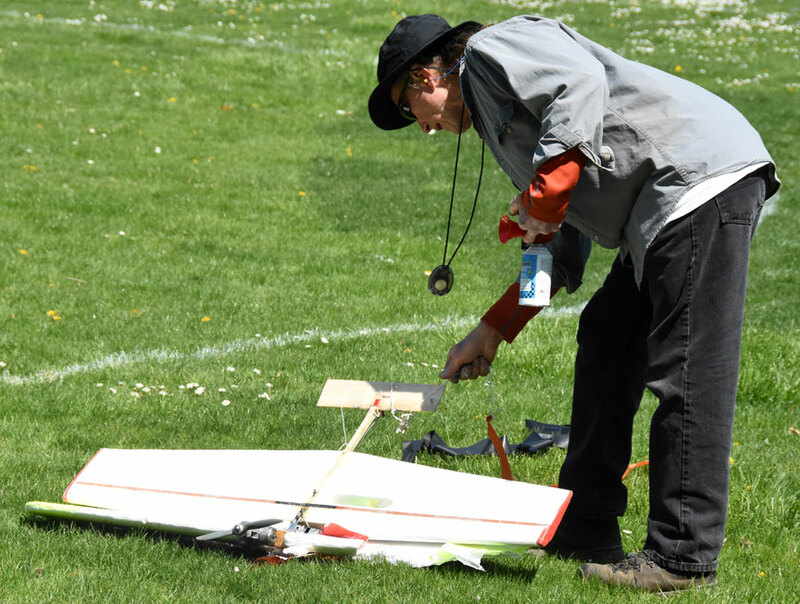 Bruce Tunberg prepares his F2D Proto Speed plane for a flight. Flying Lines photo. 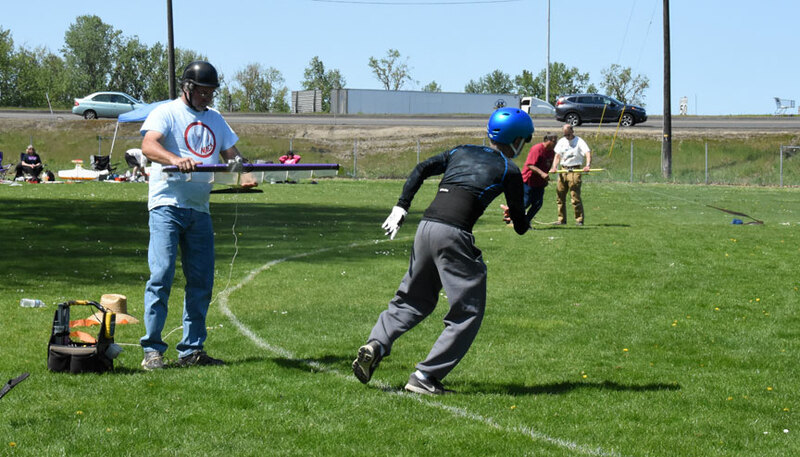 Chris Sackett works the monoline handle in a Speed flight. Flying Lines photo. Action in the Combat center circle: Left photo: Buzz Wilson (left) and Robert Smith. Right photo: Gene Pape (left) and Don Jensen. Flying Lines photos. B Proto, a simple Speed event using O.S. LA .25 engines, has become popular. At left is Steve Lindstedt's, and at right is Don Curry's. Flying Lines photo. A lineup of Navy Carrier planes. Flying Lines photo. 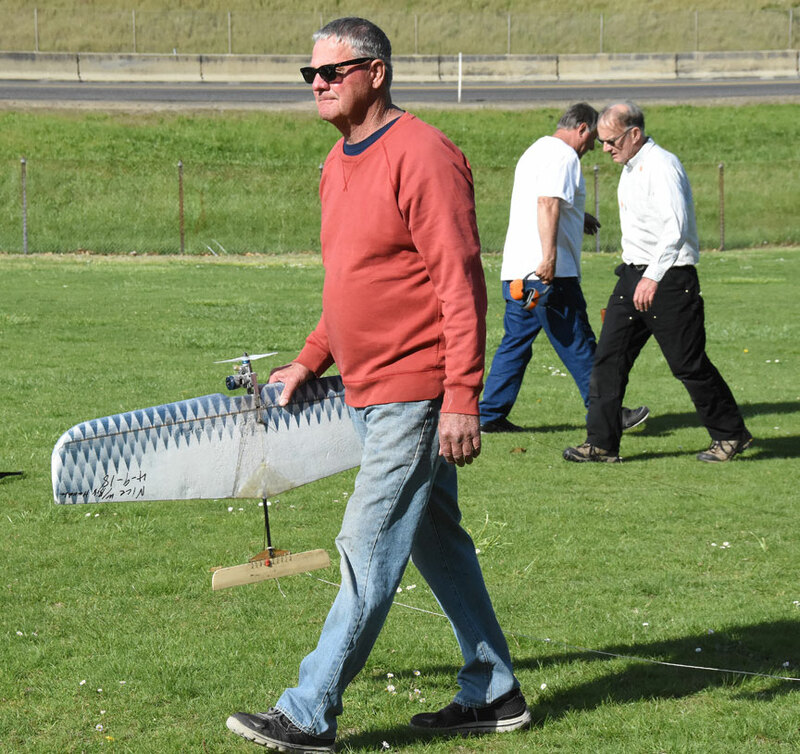 Mike Rule carries a Combat plane back to the pits after a match. Flying Lines photo. The Combat pits were busy for two long days. Flying Lines photo. 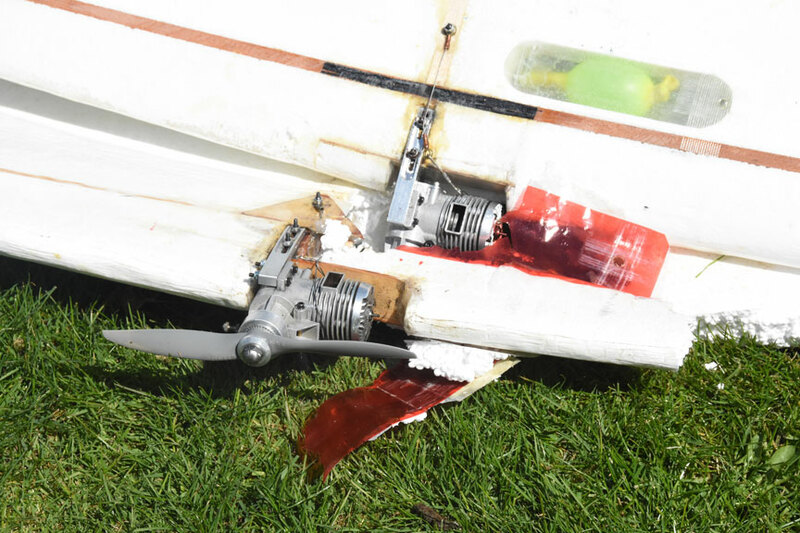 Mike Hazel's Sport 40 Carrier plane bounces on landing -- but it caught a wire. Flying Lines photo. 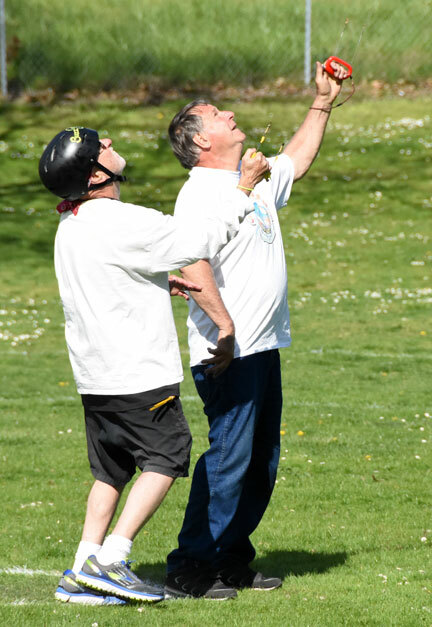 Combat Event Director Gary Harris checks to see if a kill has been scored against either of two planes that collided. Flying Lines photo. 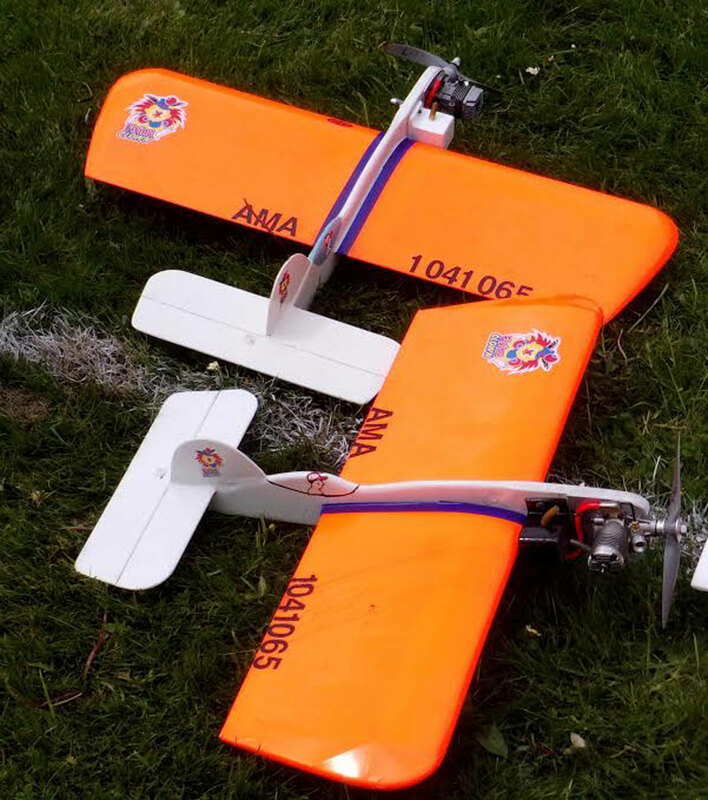 A closer look at the two AMA Fast Combat planes from the above collision. Plane on bottom is Buzz Wilson's, with Gene Pape's Nelson .36 "mated" into the center of it. Flying Lines photo. 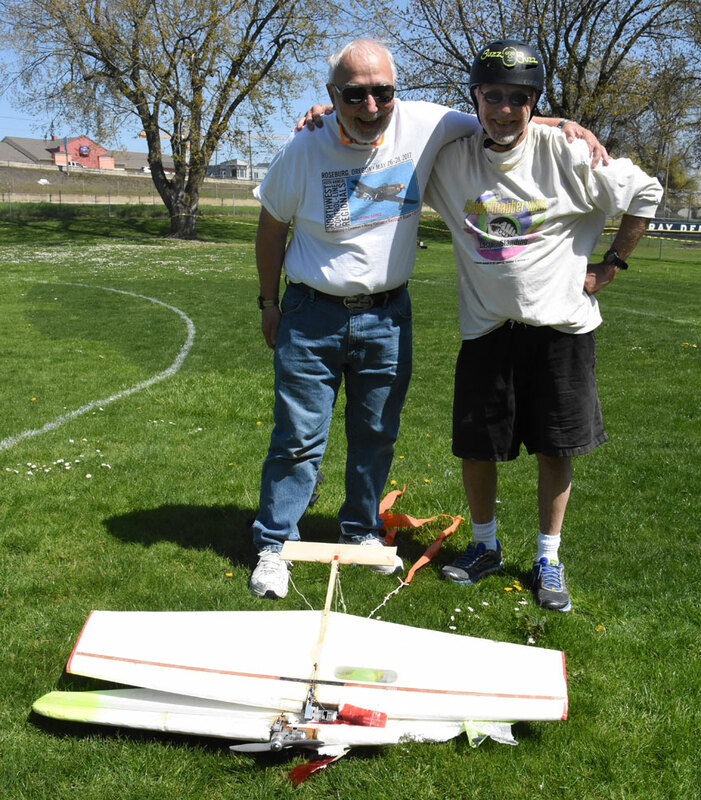 Pilots Gene Pape (left) and Buzz Wilson with the wreckage. That's why Combat pilots bring lots of planes. Flying Lines photo. Jeff Rein (center) and Robert Smith (red shirt) run for their handles as John Knoppi holds for Jeff and Jim Green holds for Robert. Flying Lines photo. 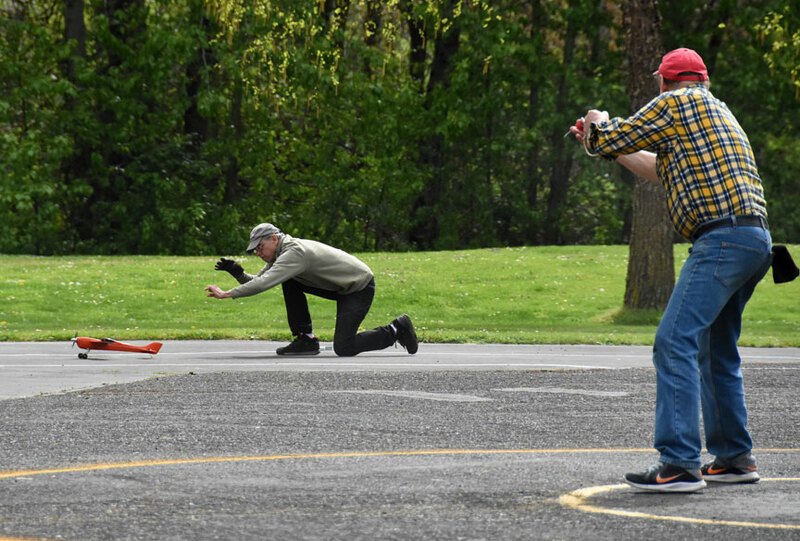 Robert Smith launches a Fast Combat plane for Jim Green, as Jeff Rein prepares to launch for John Knoppi. Flying Lines photo. Left photo: Jim Green (left) and John Knoppi battle in a Fast Combat match. 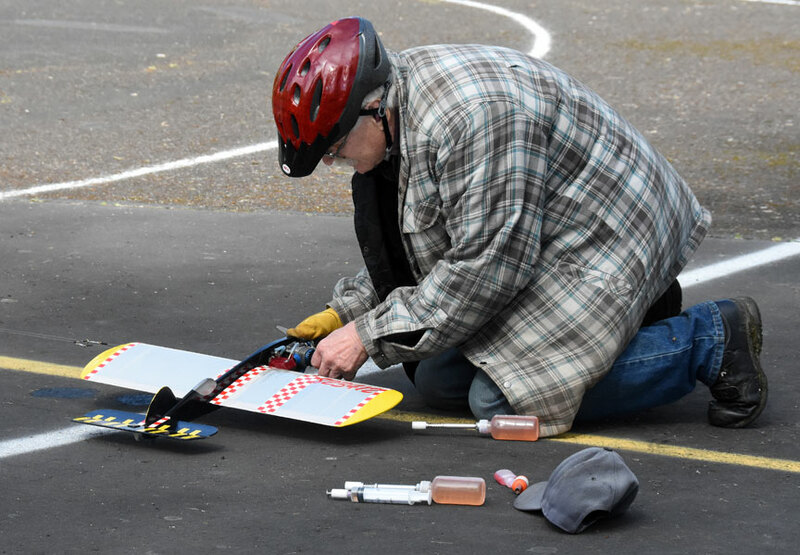 Right photo: Ken Burdick pilots a speed plane. Flying Lines photos. All stunt planes are weighed to determine the pull test. Mike Hazel's Corsair is on the scale. Rich Salter photo. Nice-looking Profile Stunt plane, built by Bruce Hunt and repaired from a crash by Jerry Eichten. Steve Linstedt photo. Two Clown Racers by Leighton Mangels. Steve Linstedt photo. Chris Sackett's Smokin' Joe is running and ready for a flight. Steve Linstedt photo. Winners of the top gun Combat event, AMA Fast, from left: Don Jensen, first; Buzz Wilson, second, Robert Smith, third. Flying Lines photo. 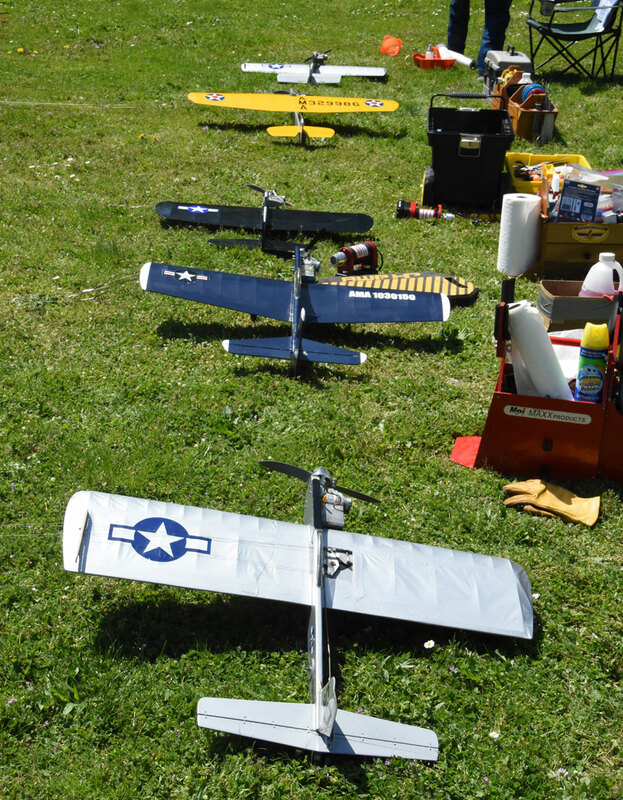 Contests often bring out some "display only" airplanes. 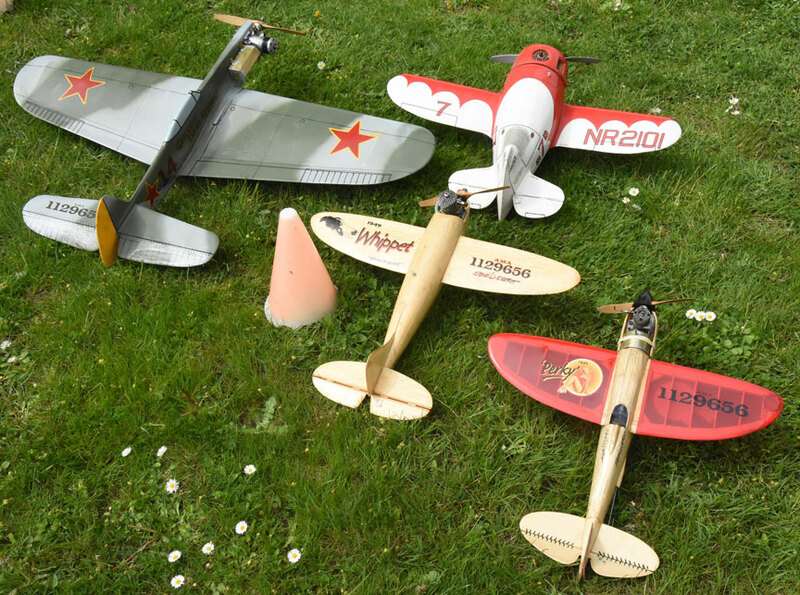 Steve Linstedt showed off this fleet of interesting planes. Flying Lines photo.